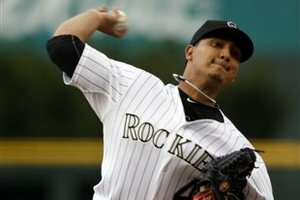 young stud in the rotation than Jeff Francis and Aaron Cook, so look for Chacin to finish out the year in style. 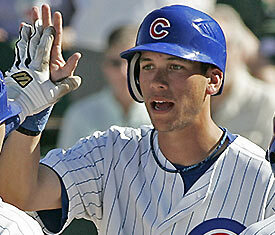 in his short stint, holding them to a .154 average and just one extra-base hit. going forward as they fight for a playoff spot. this year, so it’s not unreasonable to expect big things going forward. start against the offensively-challenged Mets is looking might juicy. It’s been an ugly year for shortstops. Real ugly. Only four shortstops currently rank among the top-100 players in Yahoo! Leagues, with none sitting in the top-40. Three of those guys — Derek Jeter, Hanley Ramirez and Jose Reyes — are having down years, while the fourth, Troy Tulowitzki, missed over a month with an injury. Ben Zobrist and his .179 average since July 1 has been a massive disappointment, Elvis Andrus hasn’t stolen a base since August 1, Rafael Furcal can’t get back on the field, Stephen Drew is a disaster and Jason Bartlett has resumed being Jason Bartlett. There’s been a lot of talk about promoting a Grenade Free America lately, and apparently Major League shortstops are on board — only five of them have blasted double-digit bombs this season. Really, there are only seven or eight guys at the position who have put up acceptable fantasy numbers, and that’s begrudgingly including Juan Uribe, Alex Gonzalez and the injured Furcal. That leaves plenty of waiver wire scavengers in 12-team mixed leagues, and right now there’s a couple of widely available guys raking enough to be relevant in this season’s bare crop. Cabrera headed into the year on plenty of mixed-league rosters after an impressive .308-6-68 campaign with 17 swipes in 2009. A lackluster first 35 games and then a fractured forearm on May 17 cause his ownership to plummet, as the fourth-year switch-hitter missed the next two months recovering. He scuffled initially after returning on July 20, but turned it on when the calendar turned to August with a .339 average plus nine ribbies, three steals and a long ball thus far. Things got even better over the past week, as Cabrera ran off a string of four consecutive two-hit efforts and has gone 14-for-31 (.452) over a current eight-game hit streak. It took a few months, but the talented rookie has finally started to figure out Major League pitching. He’s hit .302 since July 1, and an even more impressive .352 with six steals over his last 21 games. After shuffling around different the lineup during an up-and-down first half, Desmond is now firmly entrenched in the Nationals’ two-hole. With five swipes in his last 11 contest and a two-homer game on August 11, the righty batsmen is starting to truly flash the five-tool ability that Washington expected when they named him the starter on Opening Day over veteran Christian Guzman. These two share plenty of similarities. Both are 24-year-olds batting in the two-hole for non-contending teams. Desmond has the always-tantalizing power-speed combo going for him, while Asdrubal is the slicker fielder who recently made one of the season’s most incredible plays — a barehanded grab and throw while basically on his back. What really separates these two? ASDRUBAL, ASDRUBAL, ASDRUBAL. It’s really one of the coolest names in sports, and the extremely childish play on it, which doesn’t need repeating, is even more entertaining. And of course, with Desmond there’s that adage about never trusting a guy with two first names (yea, really trying here). So while its not a very convincing victory, Asdrubal scratches out the lead here. Desmond’s stretch has been very impressive over the past six weeks, and he now has a solid .269-13-61 line with 15 steals in 453 career at-bats dating back to last season. While it’ll be tough for him to continue his plus-.300 clip, Desmond has the higher ceiling and his power-speed capabilities hold a lot of value. On the other hand, Asdrubal has the track record and is a sure bet to hit close to .300 the rest of the way. But when it comes down to it, he doesn’t offer enough speed or score enough with the weak lineup behind him to offset his complete lack of power. With Desmond’s recent revelation on the base paths, you know you’re getting plus production in at least one category, while Cabrera doesn’t truly excel in any. In the end, Desmond just offers more and is ultimately the guy to grab. Once upon a time in mid-April, Julio Borbon owners were frantically searching for a speedy replacement as the Texas outfielder’s average was plummeting to somewhere around that deep limbo level from Leo DiCaprio’s dreams. Journeyman vet Scott Podsednik was off to a great start, but many owners opted for the younger and more enticing Carlos Gomez who was tearing up the basepaths. Well flash-forward four months, when Scotty-Pods sits with a .300 average and 34 steals, while Gomez sits on the DL with a paltry .228 clip and just two swipes since June 8. Another encounter currently looms between two quick-footed outfielders, so here’s some help on how to choose wisely. You say TA-but-uh, I say Tuh-BA-tah. The truth is, no one really seems sure how to pronounce the 21-year-old’s name, but no matter how they do, it’s been followed up by some very complementary adjectives of late. Tabata, who posted a .297 average over five-plus Minor League seasons beginning at age 17, was called up back on June 9 after batting .308 with 25 steals in 53 Triple-A games. After scuffling in June, Tabata started putting it together in July with a .333 clip, 19 runs and five steals. Over the last calendar month, the speedy left fielder has hit .388 (40-for-103) with an incredible 15 multi-hit games (currently three straight). 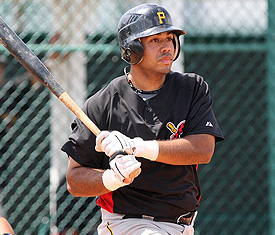 All those who showered the Yankees with praise while lambasting the Bucs after this prospect was dealt for Xavier Nady and Damaso Marte in 2008, well actually, no one blames you. This is a clear case of a blind squirrel finding a tasty, fantasy fruitful nut. Seven percent owned in Yahoo! Leagues. We’ve been through this before with Fowler, who fluctuated between a hot pickup and a quick drop all throughout his rookie 2009 campaign. This year has been no different for the 24-year-old (cue lots of commas). Fowler came into the season as a sleeper, which wore off as he struggled to a .216 average through the end of May, got demoted and hit .340 for a month in Triple-A, raked in early July after being recalled, cooled off dramatically, and is currently back to tearing the cover off the ball. The rangy center fielder is batting a blistering .417 (15-for-36) with four doubles, two steals and 12 runs scored over his last nine games, while ripping multiple hits in six of his last seven starts. Unlike the first two editions of PB, these two players are pretty similar. Both exciting, young, highly-regarded prospects who seem to be emerging as quality big leaguers. The only real difference is that Fowler has gotten a lot more hype and press playing for a likeable and thriving franchise, while no one truly expected Tabata to pan out because it was the Pirates that traded for him. Fowler styles with the over-sized, straight-brimmed hat, which I’m pretty sure is still cool, and has flashed the ability to make some nasty catches in the outfield. One thing Tabata has in his favor is the entire Yankee-Hater Nation pulling for him, as it’s always enjoyable to see the Evil Empire screw up with a young player. That said, we’ll give the edge to Fowler here. As just eluded too, these guys are pretty much mirror images of each other as offensive potential goes. Both should be solid sources of steals and runs with Fowler leading off in Coors Field — always a plus — and Tabata locked in the two-hole for a seemingly rejuvenated Pirates lineup. However, Tabata, at a younger age, has currently put together a more consistent stretch of production than the higher-profile Fowler has ever been able to. In reality, if Fowler was the guy batting .306 with Tabata’s recent hot streak, he’d be owned in three or four times the amount of leagues that Tabata is. Fowler is also hurt by the occasional day off in a crowded Rockies outfield, and the switch-hitter has been unable to master right-handed pitching with a .229 clip from the left side of the plate. 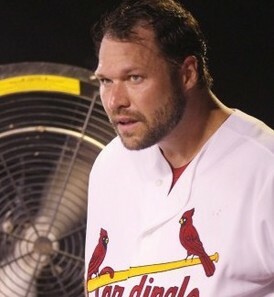 So despite the streaky Fowler’s presently scalding bat, Tabata is the guy you’ll want to grab for the stretch run. Any true follower of baseball statistics knows that what constitutes a “Quality Start” is completely bogus. It doesn’t take a math whiz to calculate that six innings and three earned runs equates to a 4.50 ERA, which is pretty much mediocre to bad, not quality. 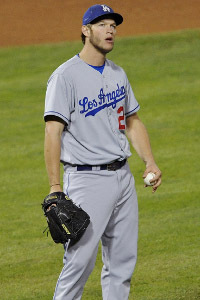 On the other hand, Clayton Kershaw fires 5 2/3 shutout innings, K’s eight and gets pulled to preserve his arm because his team is up 14-0 in the sixth, well, no Quality Start for him. At the very least, if a pitcher throws a quality start it usually means he’s keeping his team in the game, so the stat isn’t completely devoid of value in the real world. But in the Fantasy World, QS is a term that should never be uttered or written. It takes no account of WHIP or strikeouts, and no one wants a guy with an ERA much north of four on their roster. So let’s create with a term that represents a valuable outing from a fantasy starter in a league with the typical five pitching categories. We’ll keep it simple and call it Productive Performances. I thought Fruitful Fantasy Flings, while more artistic, was a little over the top (suggestions welcome). If you don’t feel like taking the time to understand the convoluted way I came up with this term, skip down to the rankings. All you need to know is that a Productive Performance is an outing that appreciably benefits a fantasy team’s pitching totals without damaging any one particular category. There are two other specific types of outings that qualify: Because why not make this more confusing? If the starter allows three earned runs over exactly seven innings (ERA of 3.86) while earning a win and keeping his WHIP at 1.65 or below, he’ll have netted a Productive Performance regardless of his strikeout total. Also, any time a guy throws at least six innings without allowing an earned run, it’s a PP no matter what the other numbers are like. These performances are just too valuable in the real world to ignore. d Matt Cain, all ranked in the Top-9 in Quality Starts, are nowhere to be seen on this list. 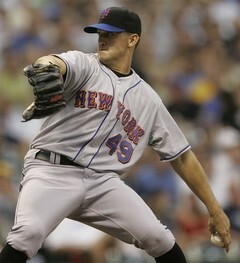 You may not have realized it, but Carl Pavano and Brett Myers have been killer fantasy starters all year. All these guys are very useful for spot starts, while Niese, Mazzaro, Davis, Westbrook and Wood should garner serious consideration in all formats. So if I ever become President of the non-existent Fantasy Baseball Association, Productive Performances is sure to be the principle measurement of a starter’s value in all leagues. But until that time, you’re not likely to see this term again except on this blog, serving as a future barometer for relevant fantasy hurlers. Good talk. Youth was being served in early May, when lots of owners scooped up the Cardinals’ David Freese over the Reds’ Scott Rolen to fill their third base slot. That choice turned out to be a season-changer in many cases, as Freese and his four home runs have been stuck on the DL since June 27, while Rolen has mashed his way to an All-Star selection and a .294-17-60 line. Another choice — though probably less critical — currently looms at the hot corner, so lets examine this week’s edition of Position Battles. 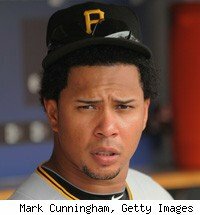 We’ve all heard about Alvarez as the elite prospect called up on June 16 to revive the Pirates franchise, so let’s keep this brief. The 23-year-old struggled out of the gate but got hot in July, clubbing seven long balls over a 14-game stretch which culminated in consecutive multi-homer efforts on July 20 and 21. He got a nice boost in ownership after this little power outburst, but in the eight games since the 21st Pedro has struggled to a 3-for-28 clip without an extra-base hit. So while Alvarez’s massive “potential” has been well documented, his 26 whiffs in 90 July at-bats remains a bit too much for comfort. The name alone will arouse the mind of any fantasy sports fanatic, evoking thoughts of the human blur who single-handedly carried owners to a fantasy football championship in 2009. But this C.J. can do two things that his pigskin namesake cannot — smile without scaring little children and mash the heck out of a baseball. 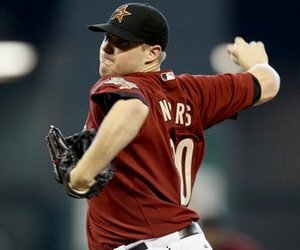 Houston’s 2006 fourth-round pick quietly got the call on June 22 after posting an impressive .329-8-33 line with a .932 OPS at Triple-A, and hasn’t stopped raking in the bigs. Having showed solid power throughout the Minors, Johnson’s muscle took a while to shine through as he went homerless through his first 66 at-bats. But the 25-year-old has found the power stroke of late, going deep four times and plating 10 runs over his last 10 contests while hitting safely in 13 straight games at a .417 (18-for-45) clip. These two couldn’t possibly be on further ends of the spectrum as far as rookies go. You have one guy who basically had a parade thrown for him in his debut, and another who virtually no one has ever heard of (four percent in Yahoo! Leagues with a .325 average?!?). We know chicks dig the long ball, and so do fantasy owners, therefore a youngster with 40-homer upside is obviously going to be more fun to own. So while telling people you own Johnson will sound impressive once NFL season roles around, the blue-chipper Alvarez reigns supreme here. On first glance you might think this would be a no-brainer, but a closer look strongly suggests otherwise. While Alvarez’s hot streak this month was impressive, he’s looked overmatched for the majority of his short stint in the Majors. The lefty batsman has been unable to figure out southpaws thus far, managing just a .193 average and a .351 slugging percentage in 57 at-bats. On the other hand, while Johnson’s .398 BABIP suggests his overall clip is likely to dip, don’t expect too much of a drop-off. 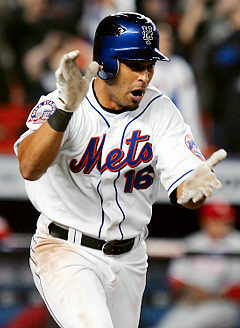 He showed solid consistency in the Minors, batting .299 while averaging 19 homers and 83 RBIs per 550 at-bats since 2008. In dynasty leagues, clearly vote for Pedro. But he appears to need a little more seasoning at this point, and the steadier and more refined Johnson is the safer choice for 2010. So if you’ve given up on Pablo Sandoval, no longer able to stomach Mark Reynolds’ putrid average, or are done with struggling third-base eligible first basemen Jorge Cantu and Troy Glaus, give Chris Johnson a shot. He’s got a real shot to give you a .300-7-30 line the rest of the way, which ain’t too shabby. 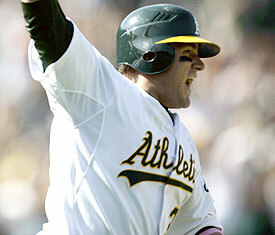 Let me preface this by saying that I am fully aware that it is no fun at all to own a position player on the A’s. 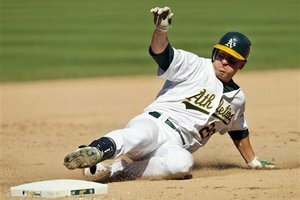 Other than a couple months of Rajai and 400 underwhelming at-bats from Matt Holliday last season, Oakland hasn’t had an offensive player of fantasy relevance since Frank Thomas was reborn in 2006 (yea, that happened). Now, Jack Cust isn’t likely to make anyone forget The Big Hurt, but his performance over the last couple weeks certainly qualifies as relevant to the fantasy world, and even mixed-leaguers should begin taking notice. It hasn’t been an easy ride for Cust this season. He went unclaimed after Oakland designated him for assignment on April 4, then spent the next month-and-a-half in Triple-A before getting recalled on May 15. He batted a solid .286 through sporadic playing time in May and June, swallowing his pride and waiting for a shot behind a washed-up Eric Chavez and a series of equally inept designated hitters. 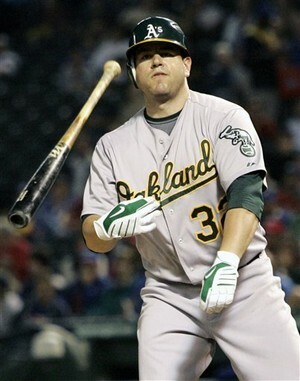 After the team’s DHs embarrassingly struggled to a combined .231-2-29 line over the season’s first three months, the offensively starved A’s finally figured it wouldn’t be a terrible idea to slot a guy who averaged 28 homers and a .840 OPS from 2007-2009 in the lineup on the regular. Brilliant! So while it must have been tough for manager Bob Geren not to write names like Chavez, Jake Fox and Gabe Gross on the scorecard every day, his pain was eased as Cust produced like a champ and embarked on a beastly tear beginning on July 9. In 10 games since that day, the powerful 31-year-old has gone 11-for-32 with six homers, 14 ribbies and 11 runs scored. That includes a two-homer game this past Saturday where he reached base five times. Reaching base has become a specialty for Cust, whose .327 average and 15 walks have culminated in an eye-popping .465 OBP for the month. Throw in a .782 slugging percentage and you get a 1.247 OPS which leads all Major League outfielders with at least 60 plate appearances in July. To get all Sabermetrical on you, only two American Leaguers with 50 plate appearances this month — Miguel Cabrera and Mark Teixeira — have created more runs per 27 outs than Cust. In other words, a lineup made up of nine Jack Custs would overcome being the slowest and most entertaining group of baserunners in history to average a robust 12.31 runs per game. **RC/27 is definitely the coolest Sabermetric stat that hasn’t gotten much love yet. Having mentioned Sabermetrics, it feels necessary to include that Cust’s .388 Batting Average on Balls in Play this season signals that his current .300 overall average has virtually no chance to last. That being said, the guy has somehow managed an impressive .332 career BABIP, so don’t expect too much of a drop-off. Cust’s power isn’t likely to let up much either down the stretch. He has a history of heating up as the season winds down, going deep every 14.2 at-bats in the August and September months from 08-09. To offer a frame of reference, Cabrera has averaged a homer every 14.8 at-bats this season and Josh Hamilton sits at 16.7. Again, Cust probably won’t be anything near the force that the aforementioned sluggers will be going forward. But if you’ve learned anything from this barrage of statistics — and here’s another — he’s definitely better than a guy owned in just 11 percent of Yahoo! leagues. With the start to the second half feeling a little stagnant in Fantasyland, I decided to a add a little wrinkle to this blogging situation. Some of the most pivotal, make-or-break situations during a season come when deciding between two players at a certain position of need to pickup off the waiver wire. Case in point: When Curtis Granderson went down with an injury back in early May, I was looking for an outfield replacement with a little speed and pop. Cameron Maybin and Chris Young were both sitting out there, and I foolishly grabbed Maybin based on his “upside” and Young’s disappointing last couple seasons. 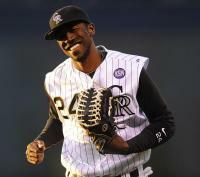 Well Maybin’s enjoying life at Triple-A right now I could sure use C.Y.’s 17 homers and 19 steals. Although I may have just destroyed my credibility, I figured I’d install a weekly feature examining the top contenders widely available at whichever position(s) are making waves that week. To help prevent you from making the same mistake I made with Maybin, I’ll try to determine which guy is best to own going forward. So here goes nothing…. It’s kind of shocking how available Smoak is right now, considering all the media love he’s gotten this year after a much anticipated call-up in April and his inclusion in the Cliff Lee trade on July 9. A lot of that has to do with The 23-year-old’s 5-for-49 skid over his last 11 games with the Rangers and first three with the M’s. But the talented switch-hitter got a jolt of life during the break and has emerged with two homers and three multi-hit games since, renewing his buzz as a hot pickup. Primarily a designated hitter but eligible at first, Scott was on the DL for the first half of July with a hamstring pull, causing his ownership to take a huge hit. 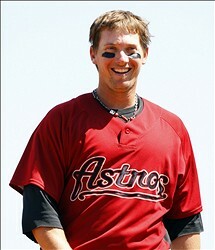 The 32-year-old lefty batsman returned on July 19 and has gone 6-for-12 with a two-homer game and four ribbies. Averaging 24 homers and 71 RBIs over the last two seasons, Scott is one of the streakiest hitters in the game. This is possibly the best and worst thing about him. A 15-for-33, six-homer, 10-RBI stretch over nine games in May can carry a fantasy team, but a .194 average like he had in April can seriously hamper one. These two guys couldn’t be more polar-opposites. You have the toolsy mega-prospect oozing with “potential” vs. the uninspiring veteran with a limited upside. While there’s something sickly endearing about a guy who chops down trees in the offseason to keep his swing in gear, Scott has been a boring name dating back to his days in Houston, and no one really loves owning a guy on the Orioles. There’s nothing more gratifying than watching a youngster like Smoak emerge as a fantasy force on your own squad. Plus he’s got that name with endless possibilities for puns, and it appears some people on this very site have gone so gitty with it that they’ve replaced all usage of the actual word with the OAK version. Justin wins here. Scott is a noticeably better hitter after the All-Star break, batting .275 with an .868 OPS compared to .260 and .839 in the first half. Smoak’s value took a nice little hit after being traded from a beastly offense at the Hitter’s Haven in Arlington to a lineup with Franklin Gutierrez as their three-hitter at spacious Safeco Field. As streaky as Scott can be, he’s actually hit .321 since the calendar turned May with a plus-nine OPS in each month. Smoak’s 16/2 K/BB rate in nine games with the Mariners isn’t incredibly promising, and he might need some more seasoning before reaching that immense potential everyone seems to agree he possesses. Smoak is definitely the more tempting option here, but it seems like the wiser move is to go for Scott — you kinda know what you’re gonna get. 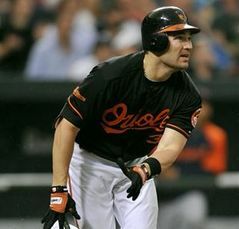 So if you have Justin Morneau sitting on your DL, or if you’re fed up with an ice-cold Troy Glaus who’s magic has worn off, Luke Scott has emerged as the guy you want to scoop up at first base for now. from becoming truly valuable fantasy commodities. his day, is trying to live vicariously on the field through his old friend Vizquel. And yes, Viciedo isn’t Mike Schmidt over at third, evidenced by his costly error on July 16. 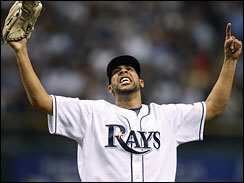 But once Guillen finally commits to Viciedo, he should have something pretty solid. short big-league stint. Sitting on the bench must be twice as frustrating for a guy who loves to swing as much as Viciedo does, so hopefully for his sake he’ll get more run in the second half. better against southpaws this season with a .300 average. on a team that’s going nowhere. vacation and has started Colvin in the Cubs’ first four games of the second half, during which he’s gone 6-for-17 with a pair of doubles and runs scored. 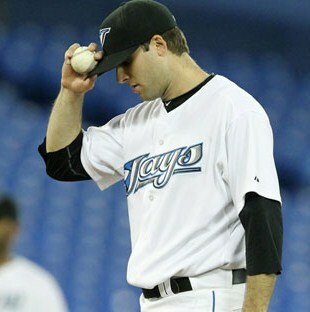 He was even slotted in the leadoff spot to face Roy Halladay on Sunday night, and responded with a 3-for-5 effort. If this is going to be the norm you won’t want to hesitate on Colvin like his own team did, so scoop the youngster up while he’s available in 93 percent of Yahoo! leagues. proven .300 hitter with legit speed and power. per 162 games in roughly 2 � seasons with the O’s. Yahoo! leagues, and looks primed for a productive second half. consider grabbing in AL-only leagues at the very least. continues the march towards 30 stolen bases. worth a spot on your roster. the pen last year, the young flamethrower has struggled to find consistency. compared to issuing 32 free passes over 45 frames in U.S. ballparks. hero yet has stuff equally electric. the best pitchers in the American League over the first half, while going 6-3 with a 2.79 ERA on the road. capability to be an elite fantasy starter. right circumstances to keep anyone from feeling ashamed to own him.